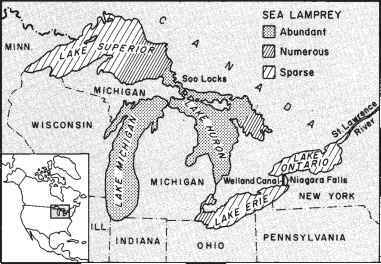 The irruption of the sea lamprey into the upper Great Lakes -Huron, Michigan, and Superior (see Fig. 9.1) - occurred at a time when both cultural and natural aspects of the Basin ecosystem were under increasing stress by factors other than the invading sea lamprey. At the time there was intense disagreement among some experts about the causes of particular fishery effects in the Great Lakes. Thus, J. Van Oosten inferred that overfishing was mostly to blame for decreases in catches of preferred species; R. Hile argued that the sea lamprey was the main culprit, at least in the three upper lakes; and T.H. Langlois invoked pollution, based on his experiences in Lake Erie (Egerton, 1985). About four decades later we note that not all the disagreements have been resolved, but that all the strong protagonists for only one of the possible explanations have passed on. With hindsight we opine that each of these "one-cause experts" had strong evidence for his views from some locales within the Basin, but insufficient evidence to generalize that inference far beyond those locales. counter "one-stress experts," usually of a rather dated reductionists mindset. Ecosystemic effects of some 18 human-induced stresses acting on the Great Lakes ecosystem were characterized by Francis et al. (1979). These included overharvesting, irruption of exotic species, nutrient and sediment loading, shore and bottom restructuring, water entrainment and diversion, and introduction of toxics, contaminants, and heat. Separately, jointly, at times synergistically but seldom antagonistically, many cultural stresses have acted on Great Lakes Basin ecosystems during the past 200 years. They have strained, overridden or crippled the self-organizing processes of these ecosystems. The result has been a debilitated condition, a general impairment of ecological integrity expressed throughout the whole ecosystem. Features of this syndrome include: a weakening and breakdown of isolating mechanisms between subsystems; a blurring or disappearance of biotic spatial boundaries between and among subsystems; a suppression of long-lived, larger, slow-reproducing (i.e., "K-type") species and expansion of smaller, short-lived ("r-type") species; and an increase in the frequency of fluctuations in ecosystem-level phenomena (Rapport et al., 1985; Harris et al., 1988; Regier et al., 1989; Regier et al., 1990). Climatic changes (in future decades) will likely contribute on balance to this "general distress syndrome" and may impede progress currently underway toward "restoring and maintaining the chemical, physical and biological integrity of the waters of the Great Lakes Basin ecosystem," the stated purpose of the 1978 Great Lakes Water Quality Agreement (IJC, 1987). Research efforts are underway to assess effects of climate change on Great Lakes fish and fisheries (see, e.g., TAFS, 1990). 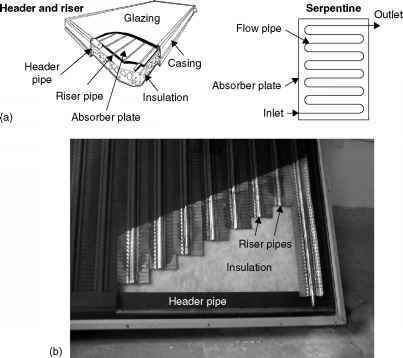 Here we offer the irruption of the sea lamprey in the upper Great Lakes as a possible analogue of some unpredictable phenomena that will accompany climate warming. We have reexamined data of decades ago related to sea lamprey and relevant studies, both from the ecosystem perspective and current understanding as sketched above. The definitive history of the sea lamprey's irruption and subsequent fortunes in the Great Lakes remains to be written. The sea lamprey (Fig. 9.2) is a parasitic snake-like fish with a suction-cup mouth, horny teeth and rasping tongue; it attaches to the fish, penetrates the skin, and feeds on the blood of its victim. It prefers soft-scaled, large fish that live in cold waters during summer. In the Great Lakes such fish include lake trout, lake whitefish, suckers, and introduced salmon. Except for suckers, it shares some of our human preferences for fish! Native of the North Atlantic Ocean, the sea lamprey gathers in bays and estuaries in early spring, and migrates up streams to lay its eggs and then die. Fig. 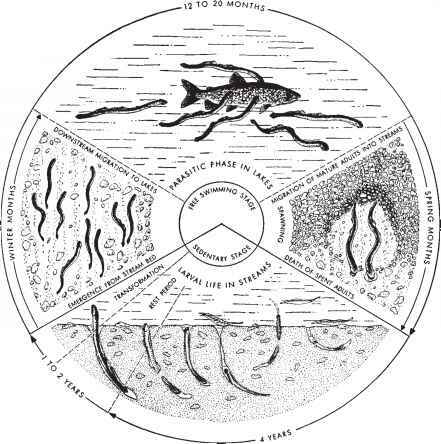 9.2 Life cycle of the sea lamprey (Applegate & Moffett, 1955). The lamprey lives 6.5 to 7.5 years. The size of each of the segments in the chart does not correspond to the length of time the lamprey spends in each stage. The lamprey spends most of its life as a larva (Applegate, 1950). sea lamprey larvae may have been introduced by anglers who used the larvae as bait; there was an organized trade in such bait. Limited damages caused by the native silver lamprey had been reported for Lake Erie. "Great runs" of silver lamprey were known in the Cuyahoga River of Lake Erie around 1850 (Great Lakes Sea Lamprey Committee, 1946). Problems with sea lamprey in Lake Ontario had been reported by Cobb (1900) and Dymond et al. (1929). However, neither the fishing industry nor government management agencies were prepared to deal effectively with the spread of sea lamprey and the devastating mortality it inflicted upon the resident salmonid populations of Lakes Huron, Michigan, and Superior. Here "salmonids" include both the salmonines (like lake trout) and coregonines (like lake whitefish). • the outbreak of World War II, which increased demand for fish, and also for young fishermen for the navies. These factors are examined in more detail below. This case study also relates to the emergence of fisheries policy at an international level and to the coordination of the actions of state, provincial, and federal agencies. These actions led to the establishment of the Great Lakes Fishery Commission. Thus, the sea lamprey problem may be seen as being directly responsible for the establishment of the first permanent international body concerned with the fishing interests of the Great Lakes. Many attempts, during the preceding 60 years, to create such a commission had failed. We do not recount the story of the recovery of many stocks of Great Lakes fish after the low point of Great Lakes fishery fortunes in the early 1960s. Thus, this is a case study of a catastrophe in which the sea lamprey played a key role.